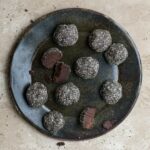 Recipe for Chocolate Honey and Chia Seed Truffles. Rich chocolate dessert sweetened with honey and coated in crunchy chia seeds. Perfect bite size dessert to serve at parties or to satisfy mid day chocolate craving. Store in the refrigerator to maintain consistency, freezes easily. Combine all ingredients except chia seeds into a medium bowl. Stir with spoon to create a thick creamy consistency. If to dry add a little oil and/or honey. If too wet add a little more cacao powder. Should be firm enough to hold shape, but bot dry. Use hands and form into small balls. Pour chia seeds into a shallow dish. Roll each ball in the chia seeds for an even coating. Place in fridge to chill and set. Once firm they are ready to eat!